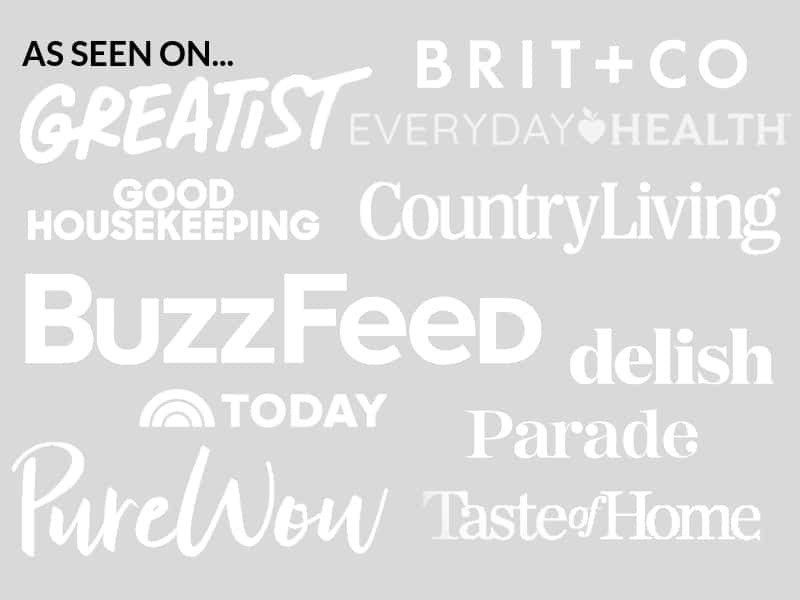 May 31, 2018 By Elizabeth Lindemann 8 Comments / This post may contain affiliate links. Move over, all other pasta salads. There’s a new kid in town. 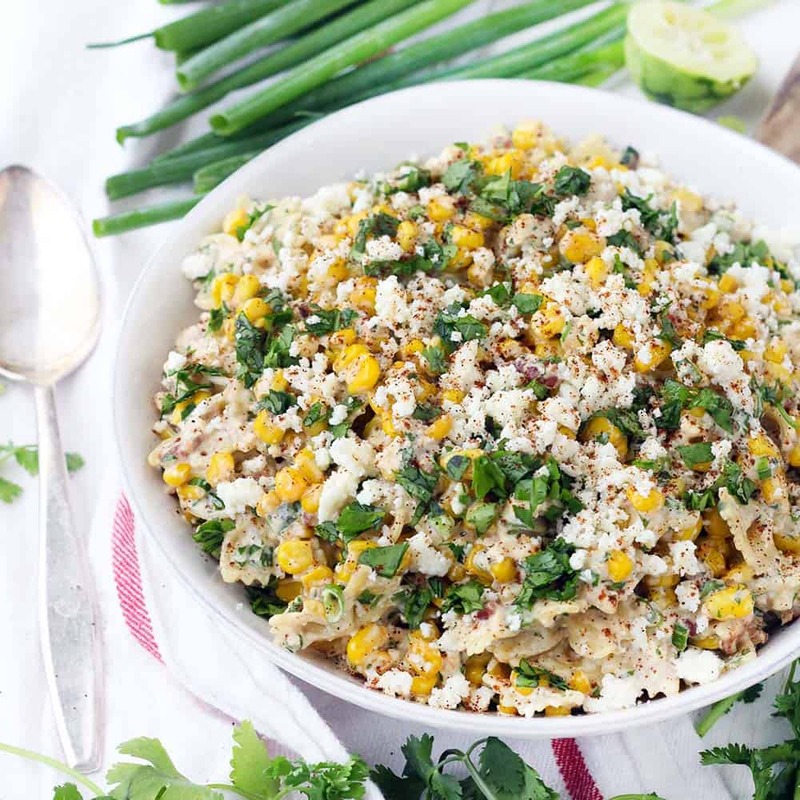 This Mexican Street Corn Pasta Salad is PACKED with super sweet corn, queso fresco, and bacon, and is tossed in a creamy chili lime dressing. It’s the perfect thing for a meal planning or a potluck, and easily can be made ahead of time. 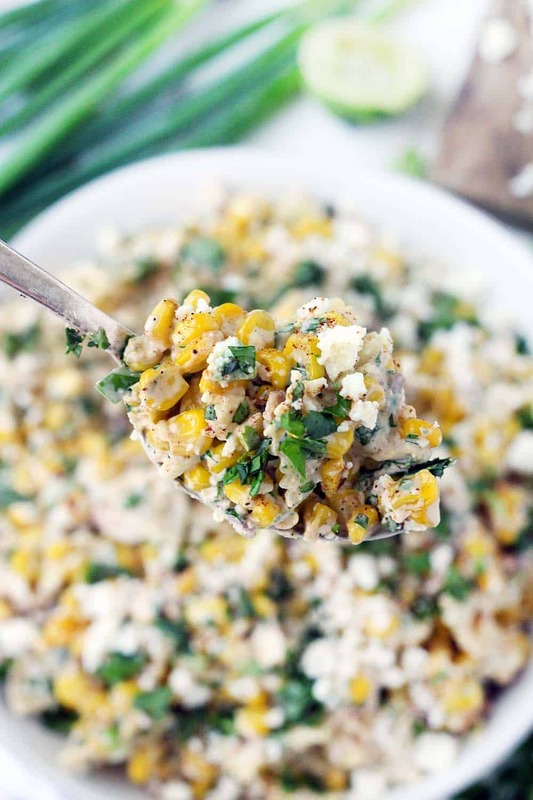 Mexican street corn (Elotes) is grilled corn on the cob, covered in a creamy chili lime dressing and cotija cheese. This pasta salad is a deconstructed version of traditional Mexican street corn, with a few tricks to get that smoky, grilled flavor without having to actually grill anything! The first trick: I added bacon. I had a bunch left over from making Breakfast BLTs a couple weeks ago, and was inspired by the recipe for a similar pasta salad on Chelsea’s Messy Apron that called for bacon. 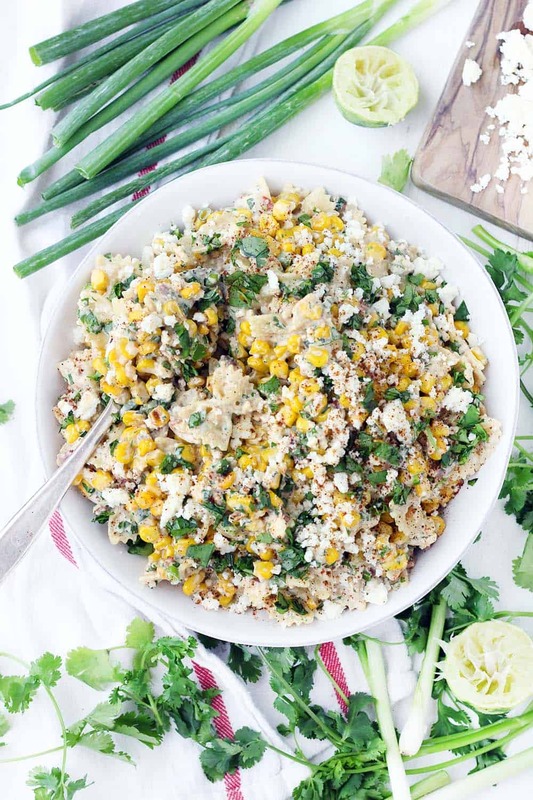 It adds a salty, smoky crunch to this Mexican Street Corn Pasta Salad and that pairs SO well with the sweet corn and chili lime dressing. The second trick: I sautéed the corn in the bacon fat. This may just be my crowning achievement as a cook. You’re welcome. Since traditional Mexican Street Corn is grilled, I wanted to make sure the corn got some dark brown color and smoky flavor before adding it to the pasta salad. 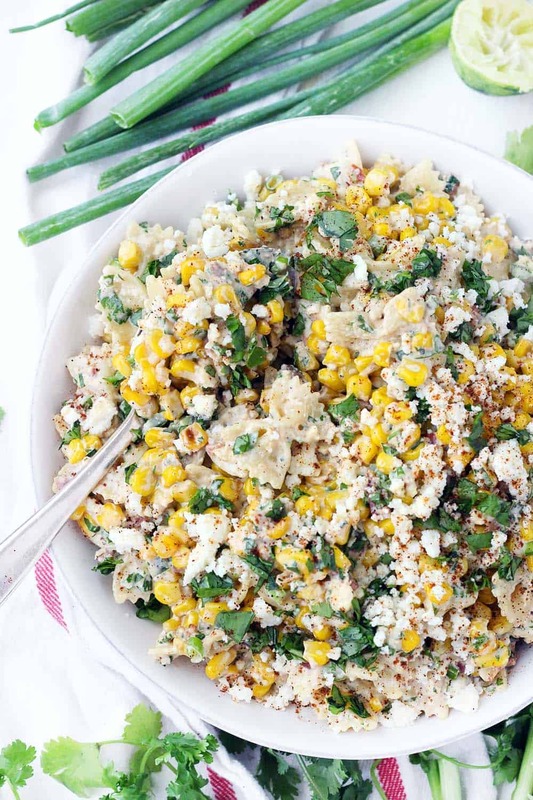 If you want to grill corn on the cob, and then remove the kernels to use in this salad, by all means go for it. This is a great move if you are planning on grilling something already. But honestly, I didn’t even use fresh corn for this. I just got a 16-oz. bag of good old fashioned sweet corn. I love using frozen veggies because they are picked when they are the freshest, and then frozen. You can always count on frozen corn to be super sweet and delicious. After cooking the bacon for this recipe, I drained all but one tablespoon of the fat and added the thawed corn to the skillet. You can also use fresh kernels removed from the cobs, or drained canned corn. Which means this recipe is great all year round! When sautéing the corn, make sure not to stir it around too much. This will ensure that the kernels get some nice brown color on them, enhancing the “grilled” flavor that we’re going for. The dressing is a mixture of mayonnaise, lime juice and zest, chili powder, cumin, hot sauce (I used chipotle tabasco, my favorite), salt, and pepper. Go easy on the salt- the pasta, queso fresco, and bacon all have plenty of salt. You won’t need to add much more. When making salads, I like to mix the dressing in the bottom of a large bowl, then add all the remaining ingredients on top to mix all together. This way, you don’t get a separate bowl dirty when mixing the dressing! After the bacon is cooked and crumbled, the pasta is cooked al dente, and the corn is done sautéing, just throw all the ingredients into the bowl with the dressing and toss together. Violà! I LOVED using queso fresco in this salad- it’s one of my favorite cheeses. It’s a mild Mexican farmer’s cheese that has a similar, but a bit more mild, taste to feta. You can alternatively use cotija cheese, a similar, dryer cheese, or feta, if you wish. 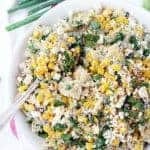 I think the best way to crumble cheese is to use a fork to pull it apart- it ensures that you get a mixture of large and small crumbles that are sure to coat every bite of this Mexican Street Corn Pasta Salad. I recommend using a large cast iron skillet to cook the bacon and the corn. Cast iron helps develop better flavor than other skillets, and the ingredients brown a bit better in it. One last tip: run the cooked pasta under cold water and shake as much excess water off as possible. If it’s warm when you add it to the salad, it will absorb too much of the dressing, and the salad will become dry. You can make this salad in advance and keep it refrigerated for up to a week, making it perfect for meal planning! 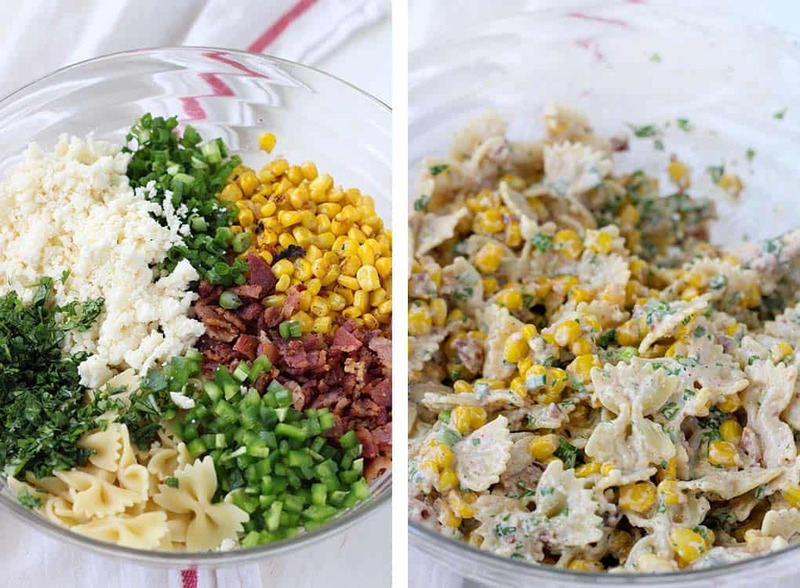 Here’s the printable recipe for Mexican Street Corn Pasta Salad. This Mexican Street Corn Pasta Salad is PACKED with sweet corn and tossed in a creamy chili lime dressing. With plenty of queso fresco, bacon, jalapeño, and green onions, this flavor-packed recipe is perfect for a potluck! Can be made with frozen, fresh, or canned corn. Plus, no grilling required! For extra smoky and charred flavor without grilling, the corn is sautéed in bacon fat. Mix all ingredients for dressing in a large bowl. Set aside. Cook pasta according to directions in salted water. Drain and rinse with cold water until completely cool. Shake off as much excess water as possible. Meanwhile, cook bacon in a heavy skillet until crispy. Remove to a paper towel lined plate and allow to cool. Crumble when cool. Drain all but one tablespoon of bacon grease from the skillet (enough to coat the bottom). Heat the skillet with the remaining bacon grease and add the corn kernels. Cook over medium-high heat until starting to brown- don't stir too often. You should get nice dark color on some pieces. Add the cooked and cooled pasta, crumbled bacon, corn, jalapeño pepper, green onions, queso fresco, and cilantro to the large bowl with the dressing. Stir to combine. Serve garnished with extra cheese, cilantro, and a little bit more chili powder, if desired. This recipe is adapted from Chelsea's Messy Apron (Thanks, Chelsea!). You can make this up to two days in advance and refrigerate until you are ready to serve. Serve cold straight out of the fridge. As an alternative to sautéing the corn in the bacon fat, you can grill corn on the cob, which is more traditional. This is great if you're already firing up the grill for other things! Just remove the kernels from the cobs after grilling (about 5 of them) and add to the pasta salad as instructed. I made this as written …adding chicken to make it a whole meal and not just a side dish and because of this I doubled the dressing. it’s VERY GOOD and easy to make as well! I had it left over a couple days later and it was still good! The queso fresco was so good..and the chipotle hot sauce added a good flavor.. the bacon was just enough to add crunch and flavor but not so much as to take over the recipe and all the ingredients just worked well together. — thanks for sharing this version..I LOVE it! Oh, my goodness! This was just wonderful, and a delicious change to the usual side dishes for us on Mexican nights. I changed out the whole corn for frozen whole kernel corn, mixed 1/4 C. sour cream with 1/4 C. mayonnaise, and instead of using only green chilies opted for a can of diced tomatoes with green chilies instead. It was a lot of changes made for using a recipe for the first time, but it still turned out tasting terrific and the family enjoyed it. It is a recipe worth keeping that you can make as hot seasoned as you like or as mild as you want. I’m so happy you liked it! Love your suggestions. Delicious! Great summer pasta salad with lots of flavor. Thanks for the recipe… I love your site Elizabeth! Made this tonight and it was delicious!! Nice to have an alternative to regular pasta salad in the summer. Yay! So happy you liked it ??? ?